The poster for UFC Fight Night: Edgar vs. Faber. 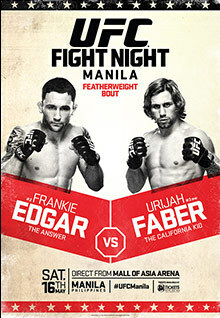 UFC Fight Night: Edgar vs. Faber (also known as UFC Fight Night 66) was a mixed martial arts event held on May 16, 2015, at the Mall of Asia Arena in Pasay City, Philippines. The event was the first that the organization has hosted in the Philippines. It took place in the metropolitan region of Manila, more precisely in Pasay. The event was headlined by a featherweight bout between former UFC Lightweight champion Frankie Edgar and former WEC Featherweight champion Urijah Faber. Luke Barnatt was expected to face Clint Hester at UFC Fight Night 63. However, Hester pulled out of the fight in early March due to a broken foot. Subsequently, Barnatt was pulled from the card entirely in favor of a matchup with Mark Muñoz at this event. It also became the final fight of Mark Muñoz's career. Roger Zapata was expected to face Li Jingliang at the event. However, on April 18, it was announced that Zapata was pulled from the fight due to undisclosed reasons. Jingliang faced Dhiego Lima. Alex White was expected to face Mark Eddiva at the event. However, on April 26, it was announced that White was forced out of the fight due to an undisclosed injury. Eddiva faced promotional newcomer Levan Makashvili. Royston Wee missed weight on his first attempt at the weigh ins, coming in at 137 lbs and made no attempts to cut further. Instead, he was fined 20 percent of his fight purse, which went to Ning Guangyou. ^ Matt Erickson (2015-05-16). "UFC Fight Night 66 attendance: UFC scores sellout in Philippines debut". mmajunkie.com. Retrieved 2015-05-16. ^ UFC press release (2015-01-28). "UFC announces first event in Manila". ufc.com. Retrieved 2015-01-28. ^ a b Staff (2015-01-28). "UFC announces May visit to Philippines for UFC Fight Night 66". mmajunkie.com. Retrieved 2015-01-28. ^ Thomas Gerbasi (2015-02-11). "Another Thrilla Heads to Manila as Edgar-Faber is Set for May 16". ufc.com. Retrieved 2015-02-11. ^ Thomas Gerbasi (2015-03-06). "Hester-Barnatt bout pulled due to injury". ufc.com. Retrieved 2015-03-06. ^ Guilherme Cruz (2015-04-18). "Dhiego Lima replaces Roger Zapata, meets Jingliang Li at UFC Fight Night 66". mmafighting.com. Retrieved 2015-04-18. ^ Staff (2015-04-26). "Alex White out of UFC Fight Night 66 bout with Mark Eddiva; replacement sought". mmajunkie.com. Retrieved 2015-04-26. ^ Staff (2015-05-01). "Levan Makashvili to face Mark Eddiva in UFC Fight Night Manila: Edgar vs. Faber". sports.abs-cbn.com. Retrieved 2015-05-01. ^ Staff (2015-05-15). "UFC Fight Night 66 weigh-in results". mmajunkie.com. Retrieved 2015-05-15. ^ "UFC Fight Night: Edgar vs. Faber". Ultimate Fighting Championship. Retrieved 2015-02-11. ^ Staff (2015-05-16). "UFC Fight Night 66 bonuses: Rare winners from UFC Fight Pass prelims". mmajunkie.com. Retrieved 2015-05-16.